For your golf party, start decorating with this Green Tissue Grass Mat, which can be used as a tabletop decoration, centerpiece, or display piece. Design your very own golf centerpiece. Unfold the Green Tissue Grass Mat, set it where ever you like, then decorate with your very own golf balls and golf tees. Cover and protect your tables with our Grass Tablecover. This unique tablecover simulates green grass, and protects your tables from spills and messes. The golfer in your life doesn't need to be a professional to be appreciated. Let him or her know they're #1 in your book with our inexpensive trophies and ribbons! Make their party complete; award them with this Number 1 Trophy, or one of these MVP Rosette Ribbons. A golf party is perfect as a theme birthday party, a retirement party, or anytime you want a fun reason to party. We have golf party supplies and decorations to turn your home or office into a golf clubhouse where you can eat, drink and tell stories about your golf round. We also have party supplies for retirement and over the hill parties. The first thing you need to do at a golf party is to set the table. Decorate your table with the golf cascade centerpiece or get creative and use the Green Tissue Paper Grass Mat to build your own customized golf centerpiece. Serve your hungry golfers on golf theme paper plates. We have two different designs. One has the golf design that says “ 19th Green” and the other looks like a golf ball and tees on a putting green. If you are celebrating a retirement party, use the matching Happy Retirement golf napkins. If you are looking for lighthearted golf gifts and gags we have them too. Present the Trophy Cup to your best golfer and the golf pacifier to the biggest golfing baby. For the biggest golf fanatic we have a hat and for the person who needs the most help on their drives we recommend the “Big Herbert”, not to be confused with the Big Bertha of course. Use golf hanging swirls to decorate the room along with green and white leaf garland for a golfing theme. Entertain your guests by playing our Golf Dice Game. 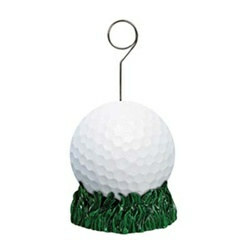 All of our golf party decorations can be viewed here or use the search box to look for a specific item. PartyCheap.com is your one stop shop for all of your party supplies.